A flatbed truck is a kind of truck used to carry loads. The load could be heavy metal sheets, machinery, bikes and vehicles, all of which need flatbed trucking insurance. These trucks are also used for towing. Either rigid or articulated, the truck’s load-carrying body is completely flat, with no roof or sides. As a result, the goods carried on a flatbed truck are more vulnerable to externalities than goods on any other kind of truck. Besides the usual hazards facing commercial truck drivers, a flatbed truck driver must also worry about unfastening straps and dislodging cargo. Several small things – such as potholes or bumpy pavements or sharp braking – could put the truck, its driver, and cargo in danger. Fortunately, a flat bed truck insurance would help protect against these jeopardizing uncertainties, keeping your cargo and you protected. Flatbed insurance can be categorized, depending on your requirements and the type of goods you’re transporting. The final impact of the accident may vary based on what’s being loaded and these covers take that into consideration as well. • Liability coverage: This is a mandatory coverage, which covers the damage inflicted upon others’ property due to your fault. • Collision coverage: This coverage pays for your flatbed hauler damage caused by an accident where usually another motorist is involved. • Comprehensive coverage: This cover insures your flatbed trailer and tractor from damage induced by external elements other than a vehicle, which could be theft, fire, or an animal suddenly crossing your path on the freeway. 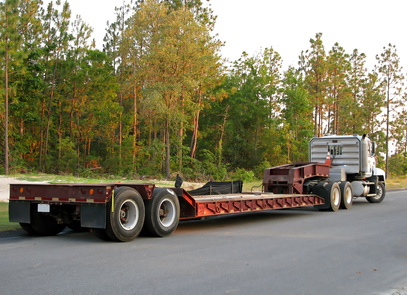 • Ramp, tarp, binder, and chain coverage: Unlike other insurance covers on this list, this coverage is unique to flatbeds as it safeguards cargo-securing equipment. • Cargo insurance: As the name indicates, this insurance type covers damage to flatbed truck-hauled freight. • Unloading and loading coverage: An insurance to cover vulnerabilities that may arise when a commodity gets unloaded or loaded. • Storage and towing coverage: This coverage covers vehicle towing and storage. • Combined deductible: Post an accident, you are supposed to pay just one deductible instead of deductibles each for cargo, liability, collision, etc. • Loss mitigation: This cover insures against any extra losses post a documented accident. • Debris removal: This cover pays for the removal and pick up of cargo that’s spilt on the road post an accident. • Earned freight: This insurance type covers income lost if there is an accident and the shipment cannot be delivered. Generally, the bigger the vehicle, the larger is the insurance cost since the risk for the insurance company is bigger. As aforementioned, a flatbed truck is different from traditional load-transporting trucks. Therefore, some modifications have to be done to regular truck insurance policies to accommodate the flatbed truck, particularly if the flatbed truck is only used for cargo transportation. The cost of a flatbed insurance could be anywhere between $7000 and $12000 per year. This variation exists because the insurance cover is based on several factors, such as location and operating region, driving experience and record, preferred coverage type, coverage limit, and deductibles. Though the initial two factors are not within your control, the last three variables can be customized to decrease the premium. If you are keen on a low cost, you may go with minimum coverage, a high deductible, and a low limit. However, heed caution because if you’re on minimum cover and you happen to be in an accident, you may end up remitting huge out-of-pocket expenses. One effective method to decrease the insurance costs sans giving up complete coverage is shopping around and getting quotes from various flatbed insurance firms. Comparing several commercial insurance agents’ rates was not that easy before. However, several firms have made the process easier in the recent past. A simple form-filling exercise is all it takes.